After three days of play, Jessica Dawley has been crowned as the new Champion of Event #57: $1,000/$10,000 Ladies No-Limit Hold'em Championship! The tournament attracted 696 players from all over the world but the all-American final table was a reflection of where the majority of the field was coming from. 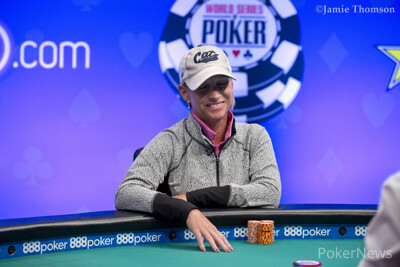 Dawley beat Jill Pike heads-up to win her first gold WSOP bracelet and the first-place prize of $130,230. ''I can't even put into words," said Dawley after her maiden bracelet win. "It has not hit me yet. I kept picturing myself as I was sitting here, I kept looking at these boxes of everyone in their bracelet photos, and I honestly kept trying to get my head straight with that. Looking at those pictures, I was like: 'I just really hope that that's me at the end of the day'. I'm just really happy. It's been a grind for the past ten years so I'm happy to have something to kind of commemorate that." This is Dawley's biggest recorded live tournament cash ever, surpassing her previous two biggest results she achieved in 2015. This is Dawley's fourth time cashing in the Ladies Championship with her first taking place in 2011. 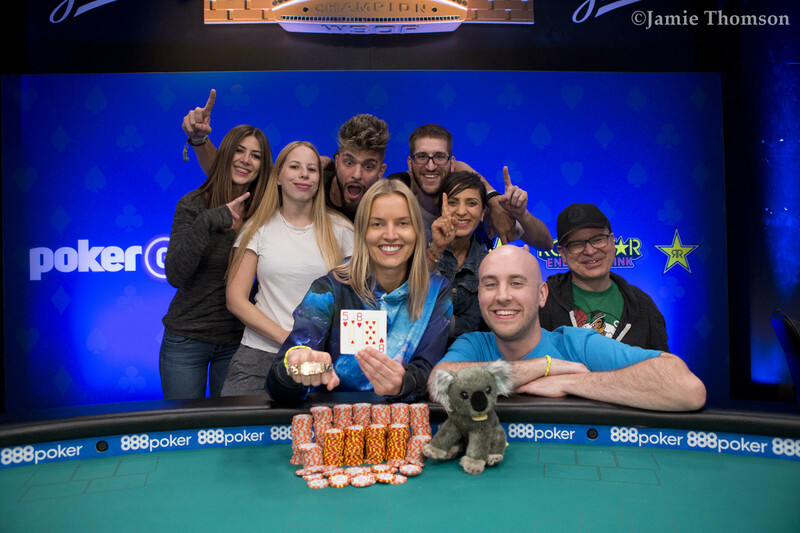 For Pike, her second place finish was also her first ever WSOP cash, making it a memorable one. 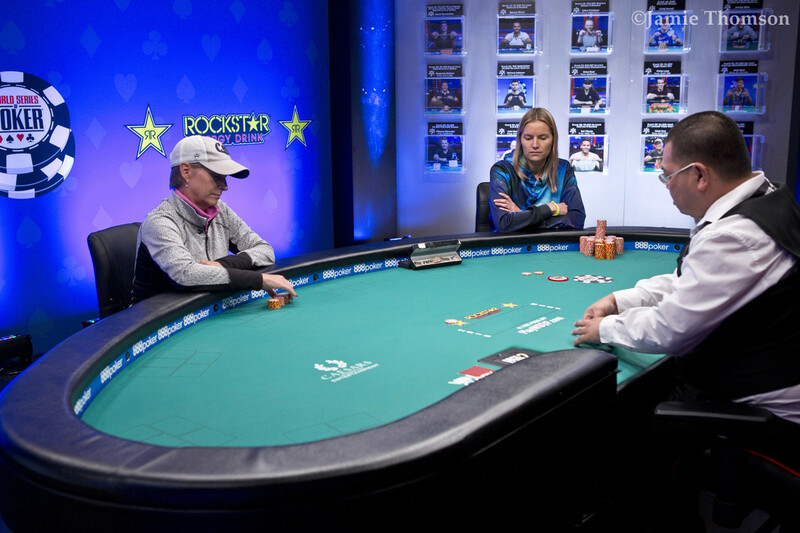 Dawley and Pike were joined on the final table by Lisa Fong, Mesha James, Jacqueline Burkhart, Tara Cain, Weiyi Mo, Molly Mossey, and Tara Snow. Ten players returned to the Brasilia room to play down to the official final table. 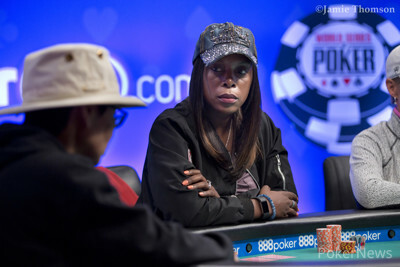 Within the first 15-minutes after play had started, Danielle Andersen was sent to the payout desk as the final table bubble after check-raising all in on the turn with ten-eight. Andersen had turned a straight, but Dawley had turned the higher straight and the board bricked out for a chop on the river to send Andersen out in tenth place. The first casualty of the official final table was Tara Snow, who moved all in for five big blinds and was called by Weiyi Mo. Snow held ace-ten against the four-three suited of Mo, who hit the river to eliminate Snow. Six hands later, Molly Mossey ran her pocket sevens into the pocket aces of Pike. No help came on the board and Mossey busted in eighth place before the first break of the day. When the seven remaining players returned, they were moved to the feature table on the Twitch stage, which meant that the final table would be live streamed from then on. The laptops and phone all started coming out as the rail prepared to help their selected players. Dawley doubled up in the first level on the feature table after flopping two pair and check-raising Pike. Pike then three-bet and Dawley four-bet shoved. Pike called but her top pair was behind and Dawley's two pair held on for the double up. It would take two whole hours on the Twitch stage before Mo busted in seventh place, running queen-nine into the pocket sevens of Pike. Tara Cain departed shortly after the next break, running pocket fives into the ace-six of Dawley, who managed to find a six on the river. Eighteen hands later, Jacqueline Burkhart was eliminated when she found ace-jack in the cutoff and shoved on Pike's under the gun raise. Unfortunately for Burkhart, Pike held pocket aces. Burkhart flopped a wheel-draw to potentially split the pot, but the deuce never came in and she was out. Dawley kept badgering the rest of the players and started rebuilding up the chip lead after having doubled up Lisa Fong. Dawley then lost a big hand to Pike's pocket kings which saw the latter take over the chip lead going into the dinner break, having almost as much as her three opponents combined. 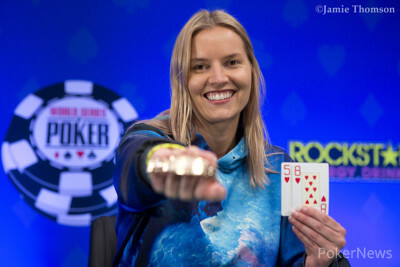 ''When it got four-handed I had to take into consideration I lost a lot of chips going to dinner break which made me second in chips and third and fourth were right close behind," said Dawley in her post-win interview. "I felt like I was a better player than they were so I didn't want to make any errors, you know marginal errors in that direction, so I kind of tightened up and let them play back at each other and then tried to only enter the pot when I had a significant hand. Then I was trying to play small ball with them a little more versus when I was doing earlier so I was trying to make my raise sizing a little bit smaller in case they did shove because I know they're not shoving light. So that's really the adjustment that I made.'' Dawley said about playing four-handed. In the eighth hand after the dinner break, Dawley managed to double back up through Pike with aces against Pike's sevens. The double-ups kept coming. First Fong doubled through Dawley with pocket jacks against ace-king. Then Dawley doubled through Mesha James with ace-queen against pocket tens after flopping an ace. Four hands later, it was time for James to leave the stage, as she ran her king-ten into the ace-queen of Fong. The three remaining players took an unscheduled break and when they returned, Dawley bullied the table to acquire more than 50% of the chips in play. Shortly into three-handed play, Fong ran ace-six into the pocket kings of Dawley, and despite flopping a six no further help came from the rest of the board. Heads-up play lasted all but four hands when Pike shoved for less than five big blinds with king-four with Dawley looking her up with eight-five suited. Dawley flopped a five and didn't encounter any danger on the turn or river to secured her first bracelet win. Dawley's bracelet ceremony will take place on Tuesday, July 3, at the end of the first break of Day 1B of the Main Event and the PokerNews team will be there to provide you with all the updates from start to finish! Hand #188: Jill Pike moved all in from the small blind for 225,000. Dawley called. Dawley hit a pretty favorable flop of to give her a pair. The turn and river completed the board and Dawley won the tournament, eliminating Pike in second place for $80,444. Hand #185: Jessica Dawley moved all in from the small blind. Jill Pike gave up her hand. Hand #186: Dawley got a walk. Hand #187: Dawley raised to 280,000 from the small blind. Pike folded. Hand #184: Lisa Fong shoved for 480,000 on the button. Jill Pike considered it for a while but then folded. Jessica Dawley snap-called. The flop came for Fong to flop a pair of sixes. The turn brought them the which didn't change the situation. Fong needed another ace or six to stay alive. The river completed the board with the which was a brick and Fong was sent to the payout desk to collect her cash for $55,812. Heads-up play will commence shortly once the table has been prepared. Hand #181: Jessica Dawley got a walk. Hand #182: Dawley called in the small blind and Lisa Fong checked her big blind. The flop came , Dawley bet 50,000 and Fong folded. Hand #183: Dawley moved all in from the button and both Fong and Jill Pike folded. Hand #176: Jessica Dawley limped from the small blind. Lisa Fong, in the big blind, checked. The flop was . Dawley bet 50,000. Fong folded. Hand #177: Dawley raised to 110,000 from the button. Everyone folded. Hand #178: Fong, on the button, opened to 110,000. Jill Pike, in the small blind, three-bet to 275,000. Dawley four-bet to 770,000. Fong and Pike gave up their hands. Hand #179: Pike moved all in from the button for 455,000. She got no action. Hand #180: Dawley raised to 110,000 from the button. Fong and Pike folded. Hand #171: Lisa Fong raised to 105,000 from the button and Jill Pike called in the big blind as the small blind was dead due to Mesha James' elimination in the previous hand. Pike check-folded to Fong's bet on the flop. 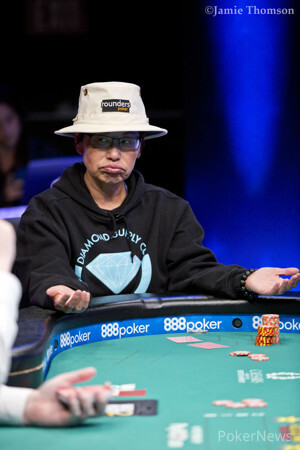 Hand #172: Fong raised to 110,000 from the under-the-gun position. Pike called in the small blind and Jessica Dawley moved all in to put both of her opponents all in. Fong looked surprised and put her hands behind her back. Fong folded. Pike did the same. Hand #173: Dawley raised to 110,000 from the small blind and Fong shoved in the big blind for 845,000. Dawley folded. Hand #174: Fong completed her small blind and Pike opted to check. The flop came and both players checked to the on the turn. Fong bet 50,000 and Pike called. The on the river completed the board. They both checked and Pike showed to take the pot down. Hand #175: Pike raised to 275,000 from the small blind and Dawley folded. 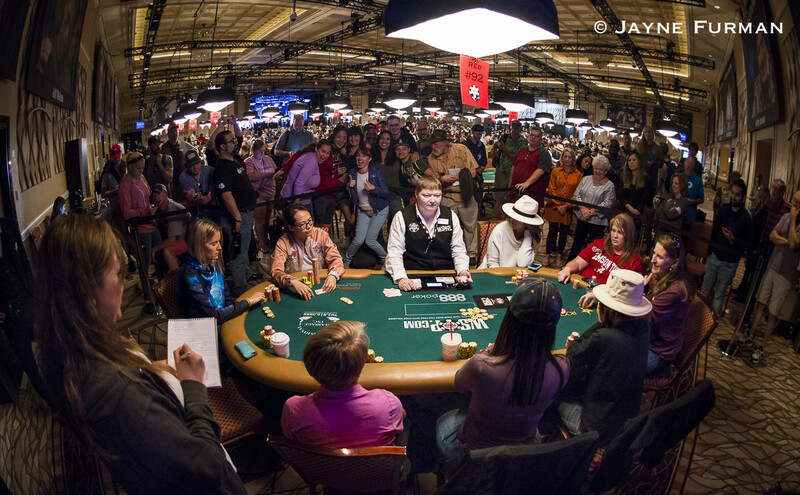 Sara Palmer had never played a World Series of Poker tournament, until this year's Ladies' Event. As a recreational cash game player, Sara had always dreamed of playing in a World Series of Poker event. It turns out the first time's a charm! She bubbled the final table, but learned a lot along the way. The three remaining players have taken an unscheduled break while the tournament clock will keep on running. Hand #170: Lisa Fong raised to 105,000 from the small blind. Mesha James three-bet shoved for 250,000 from the big blind. Fong quickly called. The board came and that was it for James, eliminated in fourth place for $39,334. Hand #166: Jessica Dawley, on the button, moved all in for 685,000. James Mesha, in the big blind, called. The board ran and Dawley found a double. Hand #167: Dawley raised to 85,000 under the gun. Jill Pike, in the big blind, called. A flop reading was dealt. Pike checked. Dawley bet 65,000. Pike called. The turn brought the and was checked around to the . Pike bet 175,000. Dawley called. Pike revealed and Dawley tabled to win the pot. Hand #168: Dawley got a walk. Hand #169: Mesha James moved all in for 175,000 under the gun. She got no action. Hand #161: Mesha James shoved from the under-the-gun position for 820,000 and everyone folded. 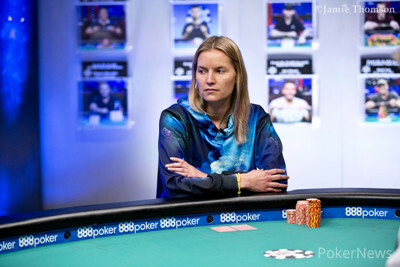 Hand #162: Jill Pike raised to 105,000 from the under-the-gun position and she picked up the blinds and antes. Hand #163: Pike got a walk. Hand #164: James moved all in for 825,000 from the button and everyone folded. Hand #165: Pike raised to 105,000 from the button. Jessica Dawley eyed everyone's stacks and then folded. Lisa Fong also folded. Hand #156: Lisa Fong, on the cutoff, shoved for 490,000. Jessica Dawley called from the big blind. The runout was and Fong doubled up. Hand #157: Dawley raised to 85,000 from the small blind. Fong folded. Hand #158: Fong raised to 85,000 from the small blind. Mesha James called from the big blind. The dealer spread a flop of . Fong bet 85,000. James raised all in for 415,000. Fong gave up her hand. Hand #159: Dawley raised to 85,000 from the cutoff. Mesha James three-bet shoved for 685,000. Dawley folded. Hand #160: Jill Pike completed her small blind. Dawley checked. The flop came . Pike checked. Dawley bet 45,000. Pike folded. Hand #151: Mesha James completed her small blind and Jill Pike raised to 190,000 in the big blind. James gave up her hand. Hand #152: Pike called in the small blind and Jessica Dawley opted to check. On the flop, Pike bet 110,000. Dawley folded. Hand #153: James shoved in the under-the-gun position and got no callers. Hand #154: Dawley raised to 85,000 on the button and picked up the blinds and antes. Hand #155: Lisa Fong shoved for 415,000 from the under-the-gun position and the rest folded. Hand #146: Lisa Fong limped from the small blind. Mesha James, in the big blind, checked. The flop came . Fong checked. James moved all in for 315,000. Fong gave up her hand. Hand #147: Fong raised to 85,000 on the button. She got no action. Hand #148: Jill Pike raised to 100,000 from the small blind. Jessica Dawley, in the big blind, three-bet shoved for 645,000. Pike snap-called. The board ran [ and Dawley doubled up. Hand #149: James, on the cutoff, moved all in for 380,000. She got no action. Hand #150: Fong raised to 85,000 from the small blind. James three-bet shoved for 455,000 from the big blind. Fong gave up her hand. Hand #141: Jill Pike raised to 80,000 from the button to pick up the blinds and antes. Hand #142: Lisa Fong raised to 85,000 from the small blind. Mesha James folded her big blind. Hand #143: Pike got a walk. Hand #144: Pike completed her small blind and Jessica Dawley opted to check the big blind. The flop came on which they both checked to the on the turn. Pike bet 75,000 and Dawley folded. Hand #145: Dawley completed the small blind and Fong opted to check. The flop came , Dawley bet 45,000, and Fong folded. The four remaining players have just gone for their 60-minute dinner break and will return around 8 p.m. local time to play Level 27 which features a small blind of 15,000, big blind of 30,000, and a running ante of 5,000.